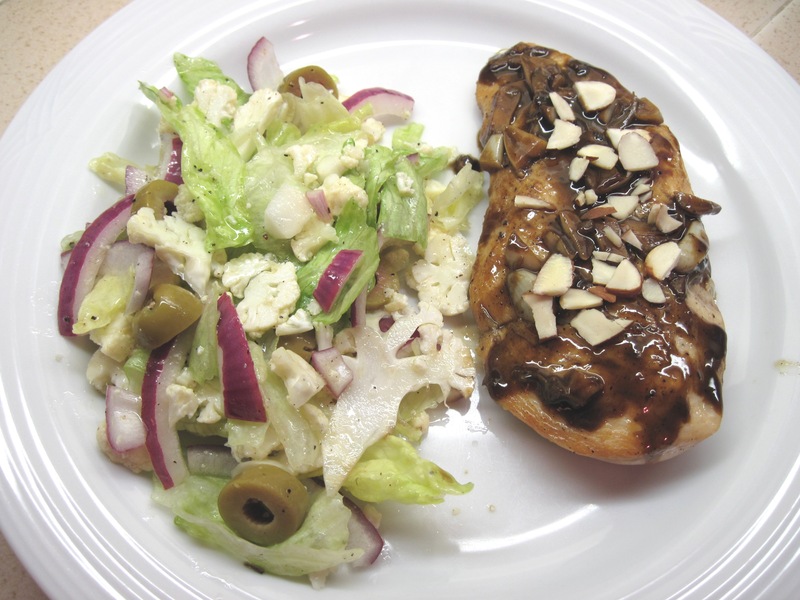 I bought 1¼ pounds of organic chicken breasts to make the Flash Chicken Sauté with Cider and Almonds from The Splendid Table’s® How to Eat Supper written by Lynne Rossetto Kasper and Sally Swift. You would think that much chicken would be 4 breasts, but it was 2 huge breasts! Using a sharp slicing knife, I sliced them in half to make 4 more reasonable portions. 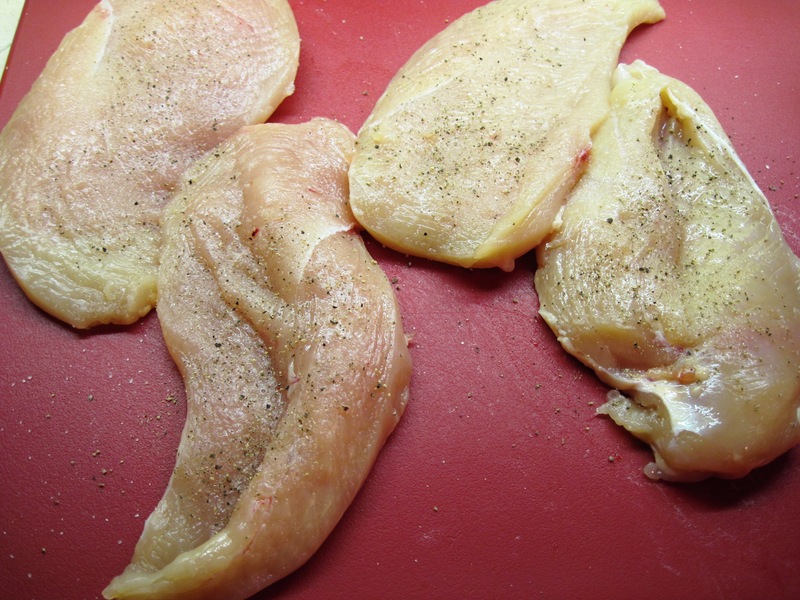 Slicing them also enables the chicken breasts to cook more evenly and quickly. I cooked them in two batches, keeping the first two warm in the oven, so the pan would not be too crowded. P.S. The salad was quickly put together; it was just sliced cauliflower, lettuce, red onions and the last of my marinated olives all tossed with olive oil and white balsamic vinegar. Salted and peppered, of course. 1. Turn the oven on to Warm and put a plate in the oven. 2. Boil the broth in a large skillet until it is reduced by 2/3. Pour the broth out and reserve it. Dry the pan. 3. Put about 2 tablespoons olive oil in the pan. Heat over medium-high heat. 4. Sprinkle the chicken breasts with salt and pepper and put the in the pan. 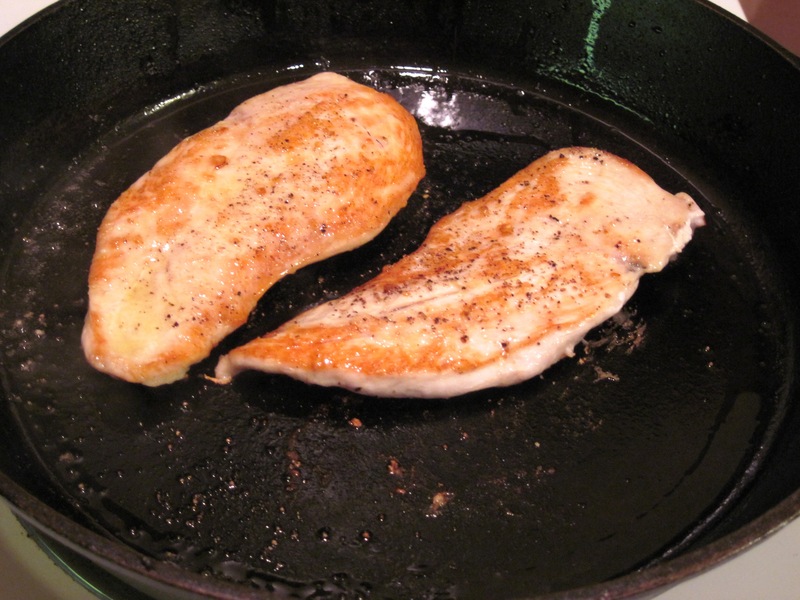 If the chicken breasts won’t fit in the pan without being too crowded, cook 2 of them for about 3 minutes on each side, until they are lightly browned and thoroughly cooked. Remove the breasts to the plate in the oven and cver them with foil. Repeat with the other 2 breasts. 5. Add the garlic and vinegar to the pan and boil, scraping up any bits on the bottom, until the cider is reduced to about ¼ cup. Stir in the reserved broth and cook for about 2 minutes. Add the butter and stir just until it is melted in. 6. 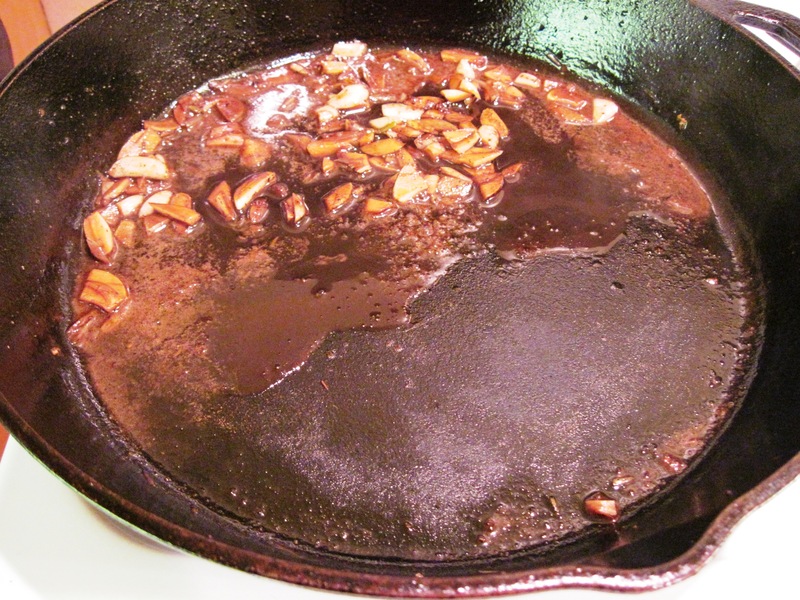 Serve the chicken with the sauce and top with the almonds.